While the company's activewear segment is posting solid growth, there's not much growth in underwear and socks, which has weighed on the share price. Check out the latest Hanesbrands earnings call transcript. Shares of Hanesbrands (NYSE:HBI) dropped 21.2% in value last month, according to data provided by S&P Global Market Intelligence. For the year, shares lost 40% in value, severely underperforming the S&P 500's decline of only 6.35%. To be sure, there was no specific company-related news to explain the sharp decline in Hanesbrands' stock last month. But when things get dicey in the broader market, the weakest of companies tend to get hit the hardest. 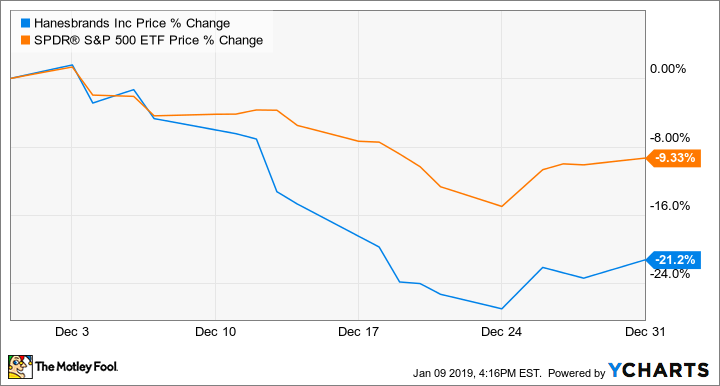 In the case of Hanesbrands, the negative reaction to a weak quarterly earnings report in early November carried over to December, which contributed to the stock's steep decline. The third-quarter earnings report showed mixed results for the socks and underwear brand. While the company's Champion brand continues to produce robust growth, the innerwear category (which is about a third of total sales) delivered a disappointing performance, with sales declining 7% year over year. Men's innerwear sales increased 5% year over year, but women's intimates declined 14%. Hanesbrands has struggled to grow total sales in recent years as competition has pressured growth in the innerwear segment. Also, the company took a $14 million charge to its operating profit in the most recent quarter relating to the bankruptcy of Sears Holdings, which will leave a small void to fill in the near term. The vacancy of sales to Sears caused operating profit to decline 1% year over year. Hanesbrands' guidance for the holiday quarter didn't spark optimism for the near term. Management expects net sales in the range of $6.735 billion to $6.775 billion, representing growth of 4.4% year over year at the midpoint of guidance. The outlook for adjusted earnings per share was lowered from a range of $1.72 to $1.80 given previously to an updated range of $1.69 to $1.73. At the midpoint of guidance, the company's year-over-year growth in adjusted earnings per share is expected to decline 11.4% in the fourth quarter. While the company nurses a struggling innerwear business, Hanesbrands has a long-term growth opportunity in activewear. The only problem is that activewear (including Champion) makes up only a quarter of total sales. Because of that, Hanesbrands will likely continue to report weak top-line growth until activewear becomes a larger contributor to total sales.